We do love New Hampshire, but we're headed to neighboring Vermont this weekend to attend the jazz festival in Burlington. If you've never been, Burlington is a great place to visit. Lots of good restaurants, Church Street Marketplace (a pedestrian mall) in the heart of the city, and of course, Lake Champlain. Burlington is known for its natural hippie vibe; folks here just seem to have a laid-back attitude. Did they invent the "green movement" in Burlington? I'm not sure...but it seems like they were tuned in to saving the environment long before the rest of us. And here's a cool fact I learned on wikipedia.com: Burlington is the largest city in Vermont. But with just under 40,000 residents, it's the smallest U.S. city that is the largest in its state. That's right...it's the smallest of the largest. While we're off to Vermont to take in some jazz, I hope you'll take out your bikes or kayaks and head to some of our favorite spots this weekend. You can find details right here on New Hampshire: Love it or Leaf It. And if you do get out there, be sure to send us a comment and tell us all about it! 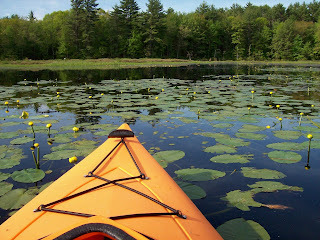 We spent a couple of peaceful hours this morning paddling Hoit Road Marsh in Concord. This is a true marsh--distinguished by its abundant vegetation and shallow depth. We recommend that you plan a trip here before too long. By mid-summer, the outer reaches of the pond will be choked with water lilies, reeds, and grasses and you probably won't be able to paddle far at all. Hoit Road Marsh was a different type of paddling experience for us-- compared with Gilmore or Willard Pond, for example, which are both crystal clear and easy to navigate. Here, the water is murky, you're hitting tree stumps, and sometimes hitting bottom. Still, we thoroughly enjoyed the marsh. It's the type of place where you can just sit and drift, watching and listening to all the birds and other critters, including snakes and a snapping turtle. We saw Canada geese, tree swallows, and most captivating of all, a Great Blue Heron from fairly close range. How large is Hoit Road Marsh? An interesting question. I found four wildly different facts on this (ranging from 71 acres to 217!) , but I'm going to go with the NH Fish and Game Department and say 101 acres. The Fish and Game oversees the marsh as a "Wildlife Management Area" and they've placed abundant bird houses throughout. 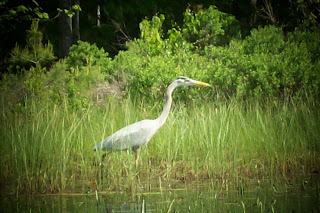 While we never did see any wood ducks which are supposed to be plentiful here, we were quite content to spend time watching the amazing Great Blue Heron. Things to Know Before You Go: The Marsh is peaceful and quiet. There are no motor boats and limited road noise. There's a gravel put-in and ten parking spaces across the road. This place is easy to find and has easy access. There are no bathroom or other facilities. Directions: Take I-93 north to exit 17. Take a left onto Hoit Road and drive for 2.5 miles. The marsh is on your left. Are you left-brained (analytical, logical) or right-brained (artsy, creative)? I'm about to offer links to some basic paddling techniques and depending on how your brain works, you may prefer one link over another. I'll start by saying this information is for beginners. We're barely scratching the surface here. Some folks will find this helpful, so I'm adding this link to GORP's article on River Basics: Strokes and Strategies. It describes forward strokes, the stern draw, and forward sweep, among other things. I'm quite sure the author know's what he's talking about, but not being a left-brained person, most of his instruction is lost on me. And for the rest of us, national champion paddler Lloyd Reeves has produced some short instructional videos available on a site called expert village. There are actually 13 short videos in the series. Topics range from how to get in a kayak safely, the correct way to hold a paddle, and basic strokes. All this being said, I think the best way to learn paddling technique is to take an in-person lesson. Many rental and touring places offer them; check out some of the links in our sidebar under Kayak Rentals and Tours. The "grand-daddy" of outdoor instruction in our area seems to be the L.L.Bean Outdoor Discovery Schools. I love that they offer a choice of long (more expensive) instruction and shorter (less expensive) "walk-on adventures." You can get a full course meal or just the appetizer! Confession Time...This is our third season on the water and we've yet to take a lesson. Up until now, we've had fun just playing. But I'm ready to learn how to get more efficient at paddling so we can take longer trips. How about you? What we found at first was an abandoned rail bed that was impassable with our hybrid bikes. There were huge tree stumps, deep gullies and rocks (shown at right). To an experienced mountain biker, maybe this is tame -- but we didn't have the right gear or experience to tackle this terrain. Luckily, there were some locals nearby who pointed us toward a connecting portion of the trail that wasn't too bad. We still had to watch out for tree stumps and some rail road ties, but there were some easier sections, too. This was a short (maybe 1.5 mile?) section of trail within New Boston that meanders along the south branch of the Piscataquog River. While I don't plan to return to this trail anytime soon, there were some positive notes: New Boston's town center is quintessential New England. There's a white steepled church, a gazebo, and a vintage country store where we bought lunch. Plus, there's one of those picture-postcard views of valleys and mountains as you drive from New Boston to Mont Vernon. Understanding Trail Designations: After we biked here, I found this trail on a NH bike map designated as an abandoned trail bed. Other trails are classified as "Rails to Trails." I'm guessing one is unimproved and the other is improved/maintained. If you have more knowledge about trail designations, please send us a comment. What to Know Before You Go: The New Boston trail is better suited for walking. If you want to bike, hybrid or mountain bikes are highly recommended. For us, this turned out to be a short 3-mile ride over some fairly challenging terrain. Hardier, more experienced types might be willing and able to tackle the longer section (8 miles round trip) which ends at the Goffstown town line. Directions: From the center of New Boston, take Route 13 North for a short distance of about 1 mile. Turn left just past a small gas station (on the right) to the 4-H Fairgrounds. There's parking there. We actually entered the trail at Lang Station, further down Route 13. Turn left on Gregg Mill Road to Lang Station State Forest. Lang Station is the small stone house originally built to shelter RR passengers. The section of trail we biked was on the same side of the road as the parking lot. Just discovered two informative websites about rail trails. Thanks to Tim Jones, outdoor columnist with the Nashua Telegraph, for mentioning www.traillink.com in a Telegraph article today. There's detailed information about some of the trails and limited information on others. But the rider reviews seem to be quite helpful and there's more useful info here than anything else I've been able to find on the internet so far. 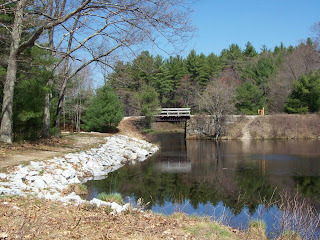 Also discovered www.nashuacitystation.com/trails.php which focuses on recreational rail trails of southern New Hampshire. This site has fewer details, but it looks like a good starting point and has links to some of the rail trail websites. Do you have any favorite biking trails to share? Be sure to submit a comment and let us know. Long Pond in Benton, NH (near Lincoln) is one of several Long Ponds in the state. We paddled here last summer and would highly recommend it if you're planning a visit to the White Mountain area. In fact, the pond is in the middle of the White Mountain National Forest. So far, it's the most remote place we've ever paddled. There's no development at all on Long Pond, unless you count the beaver lodges! 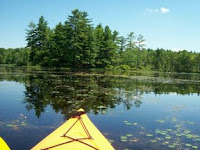 The pond is about one mile long, has lots of islands, and a shoreline dotted with tall evergreens. You'll get to enjoy beautiful views of Mount Moosilauke and probably encounter some wildlife. We enjoyed some loons when we were here. Our mid-morning excursion was a family affair -- four of us ranging in age from early 20s to (ahem) mid-50s. I must admit I struggled a little to keep up with the younger, more fit paddlers among us. It was windy the day we visited and I had trouble tracking -- that is, getting my kayak to go where I wanted it to go. Stay tuned. I'll be posting some information about beginner technique soon. In the meantime, head to Long Pond. It's places like this that make New Hampshire special. You can enjoy pristine water, watch the wildlife, and take in mountain views all at the same time. Things to Know Before You Go: Bring dollar bills. There's a parking fee ($3 when we were there) and you'll be expected to leave the fee in an envelope if no one's in sight to collect it. There are picnic tables and public restrooms. The boat launch is a concrete ramp. Directions: From I-93, Exit 32 in Lincoln, drive west on Route 112, joining Route 116 in about 11 miles. A mile farther, follow Route 116 as it splits left. After 1.6 miles, turn left onto Long Pond Road. Turn right after 2.5 miles, following signs for Long Pond. The picnic area is another .5 mile. Note that the last 3 miles is on a single lane dirt road. We spent the first part of the day in Alton Bay on Lake Winnipesaukee. Number one on our list was cheering on the runners in the Big Lake Half Marathon. Go, Meredith! 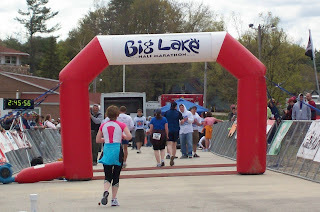 (She finished in 2:24:26 - a great time considering it was a hilly course and she didn't have much opportunity to train.) Since it's Mother's Day weekend, hope you don't mind a little parental bragging. Driving into the Lakes Region, which we hadn't done for some time, we realized just how big and busy this lake is. There's a group of active volunteers working on building a recreational trail/bicycle path along Lakes Winnisquam, Opechee, and Winnipesaukee. Not sure how far along they are, but you can track their progress and learn more at http://www.wowtrail.org/. The Natural Science Center at Squam Lake (site of the filming of "On Golden Pond") offers 90-minute pontoon boat tours with experienced wildlife naturalists throughout the summer and early fall. There are several different tour options. One trip focuses on loons and eagles and another on the natural history of the lake. Sounds to me like a great way to spend a lazy summer day. For more information, check out Squam Lakes Natural Science Center. Peaceful and protected. Two words that come to mind when I think about Willard Pond in Antrim. 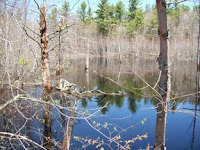 The pond is protected as part of the NH Audubon Society's largest sanctuary. The entire property, including Bald Mountain and Goodhue Hill, is well over 1,000 acres. If you paddle to unwind and get in a zone, you're going to love it here! Willard is about 100 acres, so it's a couple of hours of paddling pleasure. The water is crystal clear and the shoreline is dotted by boulders. While there aren't many places to go ashore, there are hiking opportunities to be explored in the surrounding sanctuary. As you paddle, you'll see rocks that look to be just below the surface, but then you'll glide right over them. It's all part of the optical illusion created by the clear water. Other highlights? We saw a pair of nesting loons and their baby chick when we were here last year. Gas-powered motorboats are not allowed and fishing is restricted to fly fishing only. When I think of Willard, I'm reminded of a mantra one of my yoga instructors says at the end of class: " Peace Above...Peace Below...Peace All Around." That's Willard Pond. Things to Know Before You Go: This pond is tucked into the southwestern part of New Hampshire, about a 30-minute drive from one of our other favorites, Gilmore Pond. You can drive right to the water to unload your boat, then drive back to park at the large lot. Directions: In Hancock, at the junction of Routes 123 and 137, take Route 123 northwest for about 3 miles. Turn right, going nearly straight, on Davenport Road. At a little over .7 mile, take Willard Pond Road for one mile. We took full advantage of this gorgeous spring day to take out our bikes. (Paying bills and laundry can always wait, can't they?) Our destination was the Rockingham Rail Trail, beginning near Lake Massabesic in Manchester. The terrain here was a little challenging for us, but the payoff was some great scenery. At 25 miles, this trail is the state's longest rail trail. It runs east of Manchester, all the way to the town of Newfields, which is about 12 miles from the coast. It's described as a gravel trail. To be honest, we've never biked anything that wasn't paved, so we didn't know what to expect. The answer is "a little of everything." There was mud, lots of small rocks (we're not talking "pea-sized" gravel here) and some ruts left behind by ATVs. But then, there were sections of hard-packed dirt that were just fine. I wouldn't recommend taking a regular street bike on this trail. Our hybrids (street bikes with heftier tires) did very well, even if we struggled a little from our inexperience and being out of shape. As you start out, you're following the shoreline of Lake Massabesic. Along the way, there are marshlands, ponds, and a small waterfall. It's times like these when I wish I could identify more birds. We didn't ride the entire route by a long shot. 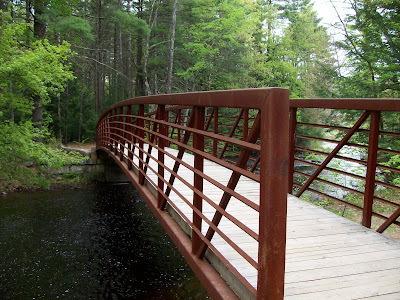 The mid-way point is Raymond, NH and after that, you bike alongside the Lamprey River. I understand the last two miles to Newfields is a jaunt through meadows and woods. Our starting (and return) point at Lake Massabesic was a good one. We enjoyed lunch at a picnic table facing the lake after our bike ride. Next time, maybe we'll bring our kayaks! What you need to know before you go: Posted signs say that ATVs and other motorized vehicles are not allowed on the trail; But one source said they are allowed and the evidence seems to suggest that you will find them here. If that's the case, then I would avoid weekends. In addition to hikers and bicyclists, equestrians are also permitted on the trail. Directions: To reach the trail's western start in Manchester, take exit 1 off Route 101 East; then head south on Route 28, proceed around a rotary, and turn left into the parking lot at Lake Massabesic. There's plenty of parking. To access the trail from Candia, take Route 27; go south on Langford Road and take a right onto Depot Road. Facilities: There are two non-flush public toilets, one is handicap accessible. Aside from bathroom facilities, you'll find benches lining the shorefront of the lake and one lone picnic table. A rainy weekend here in southern New Hampshire, so we haven't been out kayaking or biking. 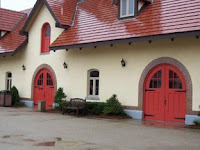 Instead, we visited the "world famous" Anheuser-Busch Clydesdales, located just down the road from us at the brewery in Merrimack. These animals are beautiful and amazing and their digs (shown below) are quite elaborate. 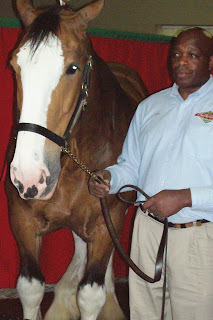 Every first Saturday of the month year round, you can "take your picture with a Clydesdale." Michael (the horse) is shown here with his handler, whose name I didn't get. A few fun facts: these horses have been used to promote Budweiser beer since the 1930s. They can weigh upwards of 2,000 pounds. To be part of the prestigious Anheuser-Busch team, they have to have four white feet and that trademark white patch on their face. So what does this have to do with kayaking or biking? Absolutely nothing! From time to time, we'll fill you in on random attractions and events around the state. In the meantime, take a tour of our sidebar. We're adding new links and information about paddling, fishing, and other outdoor resources almost everyday. Are you new to paddling? Brand new to kayaking or canoeing and want to try it out before investing in any equipment? Maybe you're just visiting the area and looking to rent a canoe or kayak? There are a couple of great places here in central New England that offer rentals and tours. 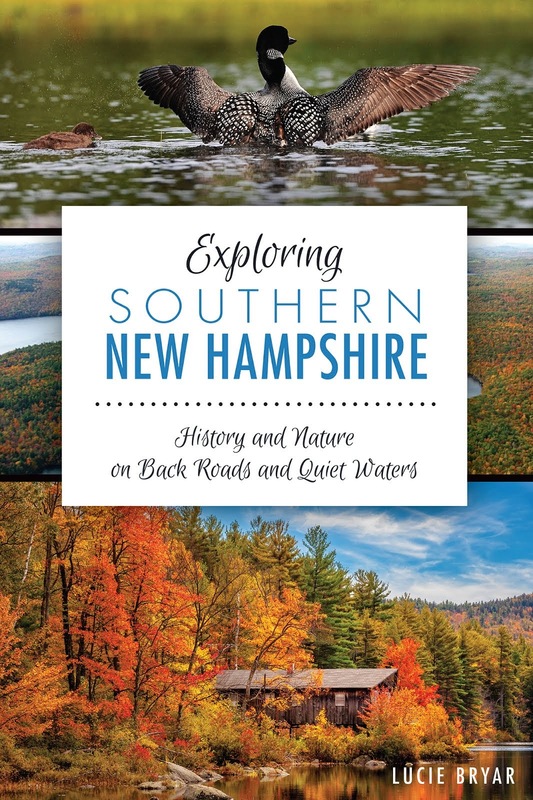 These outfitters don't originate in New Hampshire, but both will take you (either by boat or van) to New Hampshire waters. 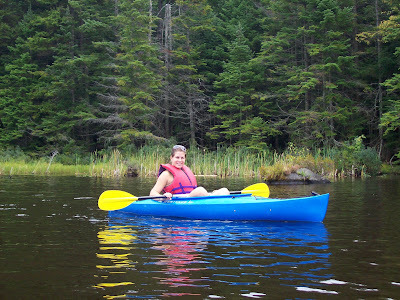 Nashoba Paddlers in West Groton, Massachusetts is a great place to start. We rented here two or three times before deciding to buy our own kayaks. They have canoes and kayaks (both singles and doubles) and they're open daily from 9:30 to 6:30 and until 8:00 p.m. on Fridays in the summer. 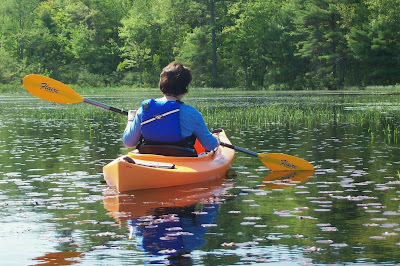 Plum Island Kayak offers easy evening tours in the Portsmouth, NH area. They've teamed up with Kittery Trading Post in Maine to offer the tours. They're only offered on Wednesday evenings during the spring and summer -- but what you give up in flexibility of scheduling, you'll make up for with perks. For starters, Plum Island Kayak offers a 20-minute orientation and review of paddle strokes. Secondly, they provide all equipment AND they transport you by van from Kittery Trading Post to the put-in site just over the border in the Portsmouth area. The guy I spoke with at Plum Island assured me that while you may encounter some saltwater (depending on which outing you select), you won't be fighting the tides. The first tour (May 28) takes place in New Castle, in an overflow basin of the Piscataqua River. These tours are classifed as easy "stillwater," with minimal currents. You'll need to register with Kittery Trading Post, but direct any questions beforehand to Plum Island Kayak by calling (978) 462-5510. Check out the Plum Island website if you're interested in tours outside New Hampshire.